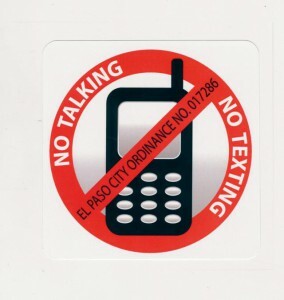 In El Paso, Texas, there is a sure fire way to get approved for ticket dismissal for distracted driving: get a bumper sticker. Motorists who are cited for the first time for texting or talking on cell phones may now have their case dismissed only if they put a red and black “No Talking, No Texting” bumper sticker on their car. The initiative, in the form of a city resolution, was presented to the City Council on Tuesday as part of a new No Talking-No Texting campaign being put together by municipal courts. The campaign is called Municipal Court Distracted Driving Awareness Month. The fine for texting or talking on a cell phone while driving is $114, but the price may be higher — being involved in a deadly crash, Olivo said. In 2011, more than 81,000 vehicle crashes involving distracted drivers occurred in Texas, according to the Texas Department of Transportation.